Here, just in time for Mother's Day, is a little known story about the enterprise that has set the bar for the practice of medicine in America. When all was said and done, it was women who served as midwives for the dream. And, it was a woman who insisted on the high standards that have made Johns Hopkins Medicine the paragon it has been. Women attended medical school in the 19th century; there were even medical schools just for women. However, women had a hard time being taken seriously at most of the top medical schools -- and that is an understatement. What made the difference? At a crucial point, a savvy, determined group of women held the pursestrings. The money earmarked for construction of the medical school was underwritten with stock in the Baltimore & Ohio Railroad. In 1888, when the value of that stock plummeted, the fate of the school was uncertain. 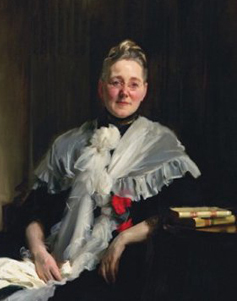 Martha Carey Thomas, Mary Elizabeth Garrett, Elizabeth King, Mary Gwinn and Julia Rogers -- the so-called "Friday Evening Group" -- were wealthy Baltimore feminists, friends, stellar fund-raisers and (except for Rogers) daughters of members of the original board of trustees. They pledged $500,000 to Johns Hopkins Medicine, but only if women were allowed to attend the school. Opposition was fierce, but the women got what they had asked for. Garrett, who contributed the bulk of the money herself, further demanded that medical-school candidates have a college degree with a concentration in basic science, and be able to speak and read French, German and Latin. William Welch himself had proposed these requirements years before but they had been dismissed as unrealistic. Now every Hopkins undergraduate, male and female, would have to meet them. 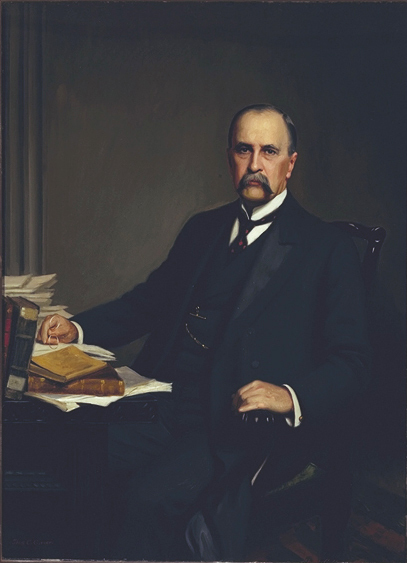 As William Osler joked to Welch, "It is lucky that we got in as professors; we could never enter as students." Of the women in that first class, one quit to become a Christian Scientist and one married her anatomy professor. Only Mary Packard became a doctor. Years later, though, Welch wrote, "We regard co-education a success; those of us who were not enthusiastic at the beginning are now sympathetic and friendly." 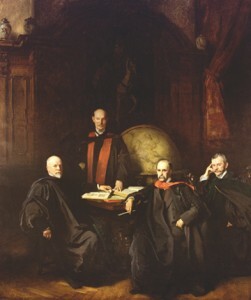 The founding faculty of Johns Hopkins School of Medicine comprised some of the most respected medical men of their era. All were innovators with rigorous standards of practice, research and training. They set the bar high for other medical schools, and many of their graduates went on to establish or transform other programs around the country. 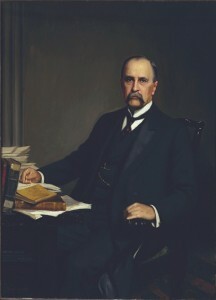 William Welch, who helped the university's president, Daniel Coit Gilman, assemble the team, was a pathologist; William Osler, the internist who oversaw the department of medicine, was a Canadian considered the finest doctor practicing in the United States; William Stewart Halsted headed up surgery; and Howard Kelly, gynecology and obstetrics. The original "Big Four" are depicted here in John Singer Sargent's "The Four Doctors," which hangs in the medical library on the Johns Hopkins campus. At a time when individual doctors could be institutions unto themselves, Osler introduced the concept of the medical residency, and Welch a training program in advanced techniques for full-fledged doctors that resembled a modern post-doctoral course. Welch also founded the country's first school of public health. Kelly established his own cancer clinic. Halsted taught his students to operate at a new level of skill and care, and was responsible for introducing the use of surgical gloves, which in beginning were meant merely to protect doctors' and nurses' hands.